1861 Wanamaker's became the first store to guarantee the quality of its merchandise in print. 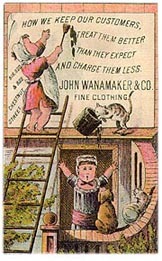 1865 Wanamaker's became the first store to have a guaranteed refund policy. 1876 Wanamaker's opened the first public restaurant in a department store. 1878 Wanamaker's became the first department store to be illuminated by electricity. 1879 Bell telephone first used in a store. 1880 First pneumatic tubes installed as cash carriers. 1896 John Wanamaker Commercial Institute established for young employees. 1899 Pianos sold at the then-revolutionary fixed-price system. 1910 Motion pictures of funeral of Edward VII first shown in America. 1911 Largest organ in the world from St. Louis World's Fair inaugurated in the Grand Court. Building dedicated December 30 by President William H. Taft. 1912 Wanamaker's, the first store in the nation to have a wireless, received news of the sinking of the Titanic. 1915 Athletic field opened on the roof of the Philadelphia store. 1916 New store medical offices opened with free care to employees. 1918 Public singing of Christmas carols in the Grand Court inaugurated. 1919 First Wanamaker Musicians' Assembly with the Grand Organ and Philadelphia Orchestra under Leopold Stokowski. 1922 Organ concerts broadcast for the first time on Wanamaker station WOO. 1948 First televised production of Wagner's "Parsifal" in the Grand Court, with the Philadelphia Orchestra. 1956 Premiere of the store Christmas Light Show, continued today by Macy's. 1980 The Wanamaker Organ becomes the first pipe organ to be designated a National Historic Landmark.